Will the 28th annual Buccaneer Days’ festivities, Oct. 5-8, be a bigger draw than in 2016? TWO HARBORS ― October brings out the ghouls, pumpkins, pirates and more. The 28th annual Buccaneer Days brings four days of “swashbuckling fun” to Catalina Island’s Two Harbors, Oct. 5-8. The event, which originally started in Avalon, has evolved into one of the largest pirate festivals in the nation, according to Catalina Island Company’s Two Harbors Sales and Catering Manager Leslie Boutillier. Last year’s Buccaneers Days had 2,800 to 3,000 people in attendance, and the majority are boaters and campers settling in for all four days, Boutillier told The Log. “This event has grown significantly over the past few years,” Boutillier said. “Previously we would hire a couple bands and have them play on the deck at the Harbor Reef Restaurant; we now work with Xceptional Music, the on island production company, and have significantly enhanced the production of the event, stage, sound, lighting, several bands, and DJs. “It is definitely a 21 and over event, however we hire a significant amount of security and additional Sheriffs for that weekend, to ensure that everything stays in control,” Boutillier added. 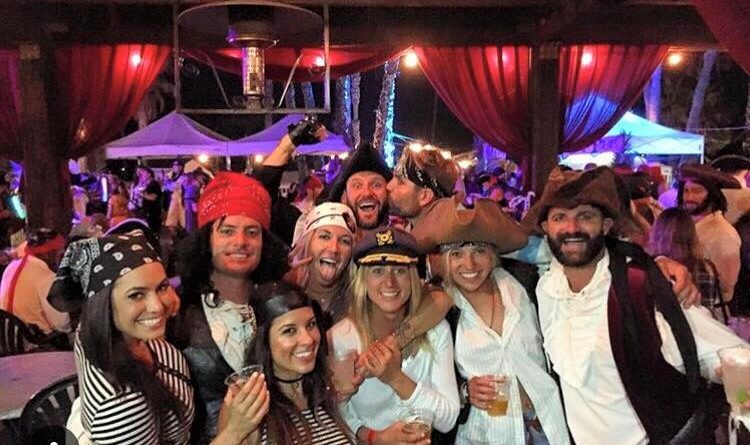 People dressed as pirates take part in costume contests and treasure hunts while enjoying entertainment from live bands and pints from the pirate’s pubs. This year’s venue takes place at the newly revitalized beach front Harbor Sands, where guests can rent palapas or chaise lounges. Tickets for VIP access, camping packages, palapa/chaise lounge reservations and general admission can be purchased online at bit.ly/2wP6ERo. Mooring reservations can also be made online at bit.ly/2opfZbe. make it fun but don’t get to commercial( pay to get on beach?) Don’t ruin Two Harbors like Avalon. Love the old days!!!! !